Welcome to Bigfoot Legend Danes, presented by Linda & Jerry Lauermann, and Steven & Greg Vigil. We are located outside Auburn in the “Gold Country” foothills and in the countryside outside Lincoln, California (near Sacramento). We are excited to have our newest kids, Merlina, Etta and Jag off to great starts in the show ring. See their new pages under Giant and Gentle Foot. Also PUPPIES… visit “Li’l” for our new litter out of our 11 1/2 year old Champion Duncan!! Pictured below is a wonderful old picture of 8 of our dogs reflecting their awesome temperament. All lived to nice old ages, 2 over 10, 3 over 11 with Merlin & Oreo over 12 and Kapalua over 14 1/2!! 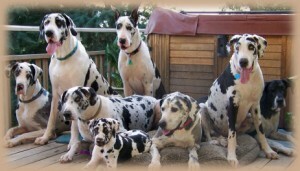 Linda and Jerry Lauermann have owned Great Danes for over 40 years. Any breeding has been carefully selected with the first focus on health and temperament, these puppies being family members first. As a result, we can take pride in having many Great Danes in the line living 11 to 14 years old. Along with health and temperament, we have focused on improving conformation and color with any proposed litter. We want to produce the finest looking, best moving lap dogs in the ring or on the family’s couch! Our Great Danes are carefully health checked before breeding for OFA hips, eye cerf, heart echo, thyroid and general well being. A Great Dane is a serious undertaking for a family to make. They cost more to raise, need a more expensive diet, will be more costly for any vet treatment because of their size, and absolutely require being a family member. These are not dogs that do well left on their own protecting the backyard. They are beautiful for everyone to see, they are definitely not for everyone to own. If you want to find out more about whether this is the breed for you, please contact us with questions and to find out more. 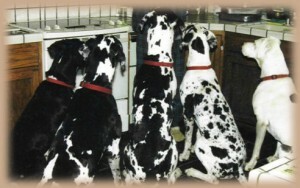 Thank you for visiting our family of Great Danes!